Muhammadu Sanusi II, current Emir of Kano speaks at the Islam in Global Africa conference event. Sanusi discussed the role of Islam in government and the importance of education. The current Emir of Kano said his daughter asked him why she couldn’t be an Emir too — while that reform may be too progressive for Nigeria now, he said it is important that she has that dream. 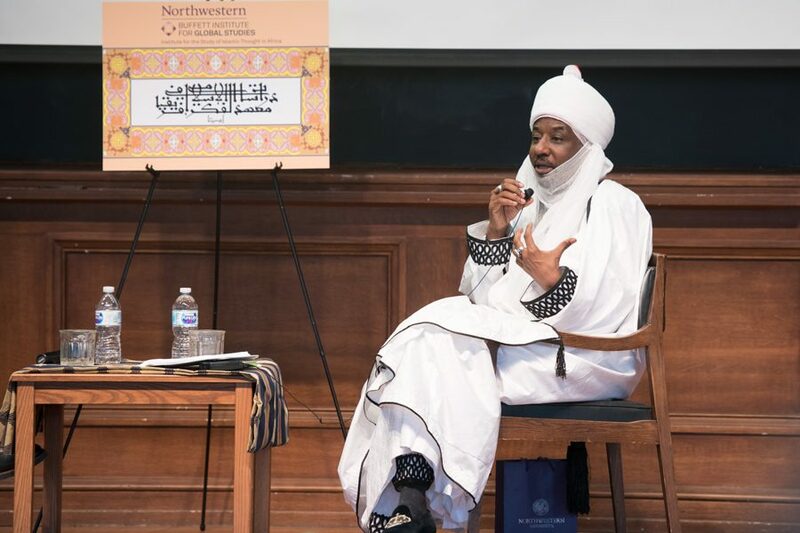 Muhammadu Sanusi II, former governor of the Central Bank of Nigeria, spoke to about 80 people in Harris Hall on Monday as the keynote speaker of the “Islam in Global Africa: African Muslims in the World, Muslim Worlds in Africa” conference. Sanusi discussed the intersection of Islamic law and the Nigerian constitution as well as the role of education in Nigerian society. The conference, organized by the Institute for the Study of Islamic Thought in Africa, seeks to “explore the multiple dimensions of Islam in the African continent,” said the institute’s director Zekeria Ahmed Salem. Ahmed Salem introduced Sanusi by listing his accomplishments, including his being named Central Bank Governor of the Year in 2010 by Financial Times and one of Time Magazine’s 100 most influential people in 2011. Sanusi explored the ways in which varying interpretations of Sharia Law interact with local and national mandates, adding that there is a necessity for a codified law that incorporates both. However, he said, discussions become more difficult when foreign powers attempt to impose their own ideals. “You have got to remember that there are multiple discourses in an environment… These problems will not be addressed by telling the government what to do,” Sasuni said. During his talk, Sanusi also advocated for access to contraception and criticized child marriages while refuting the idea that his ideals are shifting the Nigerian government toward a pro-Western agenda. Sanusi rebuked the dominance of the English language in Nigeria, questioning why the language is often a determinant of success. “The system has been rigged against those who do not have an English education and part of what we have to do in order to maintain authority is to begin to interrogate this postcolonial mindset,” Sanusi said. Ahmed Salem said Sanusi exemplifies the social, political and economic changes that have affected the way Islamic leaders are perceived in Nigeria. “I’m delivering on one of my commitments when I took up the position of director of ASITA, that is to engage Islamic authorities from Africa,” he said. DePaul University professor Heidi Nast told audience members that she worked closely with Sanusi as she wrote her dissertation on the institution of the Emir in Kano. She said that while in Nigeria, she gained a closer understanding of his goals and motives.